July 2012 Was The Hottest Month Ever Recorded In The U.S.
At the risk of sounding like a broken record, the United States is beating even more heat records. Seriously. July was the hottest month ever recorded in the United States, beating the last record from the 1930s Dust Bowl. According to the National Oceanic and Atmospheric Administration’s State of the Climate Overview, the average temperature last month in the continental 48 states was 77.6 degrees Fahrenheit, 3.3 degrees warmer than the 20th century average. 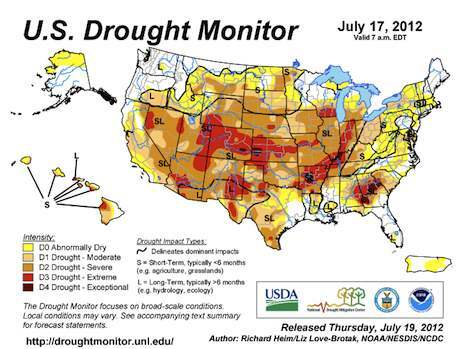 More than 60% of the country is in a “modern or exceptional drought” phase, 7% more than in the end of June. This has meant devastating effects for crops and livestock, and over 2 million acres burned across the country during July. On Tuesday, President Obama called on Congress to pass a farm bill to provide disaster aid to livestock producers. This insurance will provide a safety net for row-crop growers, but there is much less aid available for ranchers. Due to the widespread drought, crop insurance indemnities may double, or even triple, last year’s numbers. The drought has already caused U.S. prices for corn and soybeans to reach record highs over the past two months, rising between 30 and 50 percent. Although temperatures seem to be cooling down a bit now, there are still concerns over increasing food prices and the impact it will have over the winter, and even well into next year. Similar price increases led to food riots around the world in 2008. Next post: Ethical Living: How Can I Become More Self-Sufficient?